Even if you regularly clean your pool, manually or with an automatic cleaner, it’s important to brush it once a week or so. This allows you to get the hard reach areas like, behind ladders, at the water line, and stairs and steps. 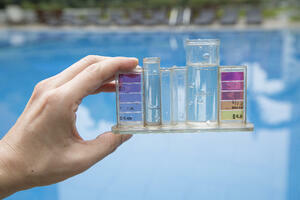 Monitoring your pool water’s pH level is critical to the health of the water and the longevity of the pool’s equipment. A low pH level indicates acidity, while a high pH level indicates alkalinity. Too much of either isn’t good, which is why it is so important to keep your water balanced. A persistently low pH can damage the pump and filter, heater, automatic pool cleaner, and more. Be sure to check your water levels at least once a week, and balance the chemicals as necessary. Your filter can only work if it’s running. It needs to run at least 8 hours a day to effectively clean the water. While this is an easy mistake to avoid, it could unintentionally happen if the filter stops unexpectedly. If you are dealing with algae in your water, using your automatic pool cleaner won’t help. Pressure-side automatic pool cleaners push algae and other debris up through a mesh bag, which gets clogged by the algae, eventually spreading the algae even further throughout the pool. Backwashing is the process of cleaning the inside of your filter. Whether it’s sand or diatomaceous earth (D.E. ), the pool water flushes any debris or accumulation out of the filter’s media. Backwashing too often can remove too much debris that the filter actually needs to optimally perform. Check the pressure gauge on your filter tank. It should read between 10 and 15 psi. The filter will actually perform better with an accumulation of debris, up to a certain point. If you notice your pressure is ready 10 psi over the normal level, around 20 -25 psi, it is probably time to backwash the filter. Lucas Firmin Pools builds custom pools and offers maintenance service in the Baton Rouge area.